Botulinum toxin has evolved from being a deadly bacteria to an important cosmetic procedure (called Botox now). It started when a scientist noticed that it relaxes the muscles. They then started testing it on humans. It was approved only 15 years ago by the FDA, and it’s already a multi-billion dollar industry. Why? Like a magic pill, when done correctly, Botox can make someone look younger than her age. Why do you think Tom Cruise still looks so young in his 50s? That’s right, he had lots and lots of Botox. Thankfully, the procedure suits him. He still looks manly and handsome. Like his role as Vampire Lestat, Tom Cruise might never grow old, really. It sure isn’t a mission impossible for him. Or perhaps he really is a vampire. Her feature, particularly her lips, is talked about all over the world. There are some who bravely undergo surgery (and risk it all) just to have Angelina Jolie’s lips. It’s amazing how the lips match the rest of Angelina Jolie’s facial features. Like a beautiful work of art, it looks perfect. Jenny is one of those who go to extremes just to avoid wrinkles and looking old. She uses Botox every two months when it’s recommended to have it at least six months. In all honesty though, she does look fantastic in her 40s, thanks to Botox! 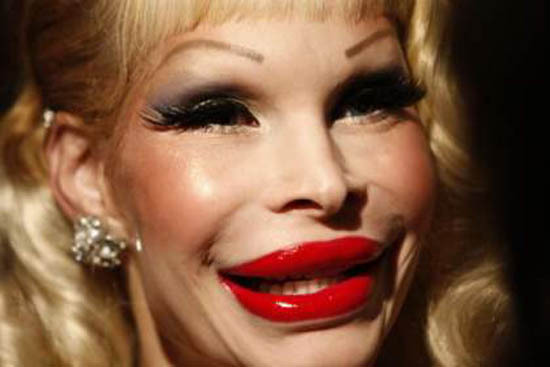 The late Joan Rivers is a classic example of a celebrity with extreme Botox. For the record, she revealed to having over 700 cosmetic procedures including Botox. Indeed, she didn’t have many wrinkles even when she was 80 years old. She died when she was 81. At first, she never admitted to using Botox. It was only years after when she revealed that she did have Botox and was overusing it. Nicole stopped the procedure when she started having problems with her forehead. Thankfully, stopping the procedure did resolve her problem. If you’re thinking about getting a Botox to still look young, it pays to remember that maintaining the procedure means paying up to $1000 every six months for the rest of your life. Yes, Botox is expensive. That’s why only celebrities and some affluent people do this. And like other plastic surgeries, it has risks. However, when you do it in small doses, it is more likely that you will get the best results. We can’t stop aging, but we can definitely delay it with Botox.